Jayson Tatum didn't play in Summer League but he has been having a very busy and productive summer. The more I see and learn about this young man, the more I realize just how special he is, both as a player and a fine individual. Do not miss the exceptional Drew Hanlen tweet towards the end of this article. The Jayson Tatum/Kobe Bryant similarities are spectacular. This summer, Tayson has been working with young kids, teen-aged aspiring hoopsters and pros. And he is absolutely taking them all to school. I know the following tweet is Tatum versus a young little guy, but he still demonstrates his Kyrie Irving-like handle. There were no reports of Jayson's miniscule defender suffering any ankle injuries. Put a bigger and more accomplished defender on him - same result! Let's go with a longer defender by the name of Mo Bamba - no problem. 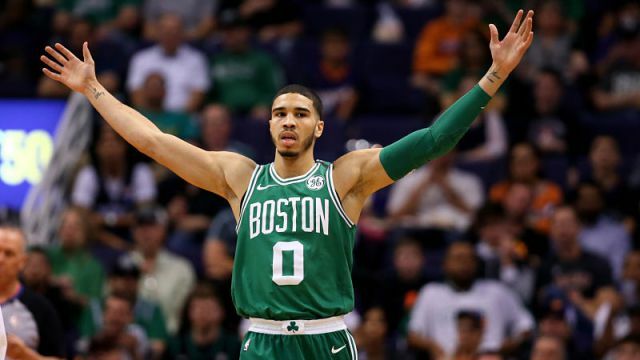 Let's face it, Jayson Tatum is rapidly becoming a celebrity. It didn't just happen. He has worked hard for what he has accomplished, and he never stops working to perfect his craft. Kobe Bryant was, and no doubt still is, Jayson's idol. Tatum has studied a lot of game film, much of it focused on Bryant's moves, and the comparisons between the two players has already started. Tatum is also increasing his strength and adding muscle mass this off-season. He is doing it all. Make no mistake. I am far from comparing Jayson to Kobe based on Bryant's peak performances and Jayson's rookie season. But Tatum has studied Bryant's moves and has copied them to near-perfection. Hanlen's tweet-video was brilliant. Jayson's NBA career could end up being just that - brilliant.